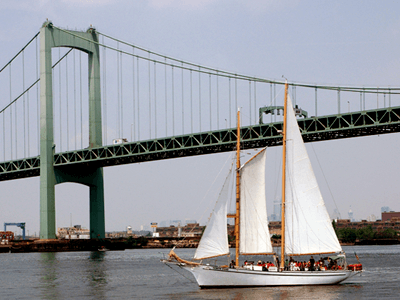 The Walt Whitman Bridge is a suspension bridge across the Delaware River connecting Philadelphia, Pennsylvania, and Gloucester City, New Jersey. Modes of Transportation: 1. The bridge provides vehicular lanes only. Please note the lane closure schedule listed below can be adjusted as needed to accommodate inclement weather and scheduled events at the South Philadelphia stadiums. • 6:00AM to 9:30AM-4 lanes open to PA and 2 lanes open to NJ. • 9:30AM to 2:30PM-2 lanes open to PA and 2 lanes open to NJ. • 2:30PM to 7:00PM-2 lanes open to PA and 4 lanes open to NJ. • 7:00PM to 6:00AM-4 lanes open to PA and 3 lanes open to NJ. • 6:00AM to 7:00PM – 3 lanes open to PA and 3 lanes open to NJ. • 7:00PM Saturday through 6:00AM Monday – 4 lanes open to PA and 3 lanes open to NJ. A $56.6 million project to blast clean and paint the towers, suspension spans and more.